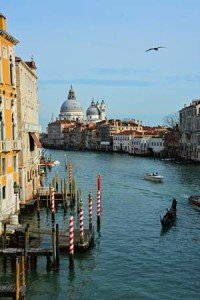 Our Venice cruise port guide gives you information about the docking location, cruise dock, transportation options and much more! Welcome to the Venice cruise port guide. 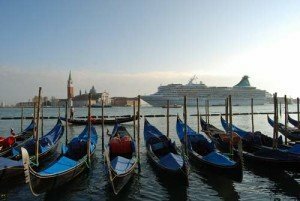 Travelling to Venice by cruise ship is a unique experience. Not only is this one of the most gorgeous and special cities in Europe. It is also a privilege to arrive in Venice by cruise ship since you will be having a first class view over this beautiful historical city. Venice is one of Europe’s best preserved historical city. 1500 years ago 117 islands were build as a refugee from barbarians. The islands would soon become a superpower of trade as they were independent from the mainland. This trading empire would later on smuggle in the bones of Saint Mark which would also give them the status of religious importance. The islands of Venice where nowadays around 60.000 people live is a pure reflection of hundreds of years of art, trade, worldly influences and architecture! Enjoy, because there is nothing in the world that compares to Venice! Taxi prices in Venice are well communicated. Look out for this signs where they are communicated. Having the experience to sail in a gondola is a must in Venice. Find the gondola all over Venice! If you have the opportunity to do this at night we would highly recommend it! Sailing into Venice by cruise ship is a unique experience. Make sure to check onboard when your ship will enter the canal. Your cruise ship will dock at the Station Maritime which is on the islands of Venice. You will find the cruise port is around 1,5 km from the train station and city centre and about 3,5 km from San Marco Square. There are six cruise terminal buildings in total. MSC mostly uses pier Isonzo 1 and Isonzo 2. Smaller ships can use the Santa Marta and San Basilio docks. In front of pier 103 (top of the harbour) you will find a waterfront strips where you will find the vaporetti and taxi boats. The People Mover is just a 5 minutes walk from the cruise terminal. Most cruise lines run a shuttle service between the Venice cruise port and Piazzale Roma (main transportation hub). Ask your cruise line for details. At about 350 yards/meters walk from the cruise terminal you will find the Venice People Mover. See exact location on the map above. The People Mover is a short metro line that can take you from the cruise terminal to Piazzale Roma. Piazzale Roma is the main transportation hub in Venice where you will find your public buses, ferries, taxis, hop on hop off boat etc. The square is also next to central station Santa Lucia. Pay 1,50 euro to ride the people mover. You can check the operation hour of the People Mover at the station. Water taxis are a great way to explore Venice, although they are rather expensive. Expect to pay a starting fee of 15 euro and an additional 2 euro per minute. 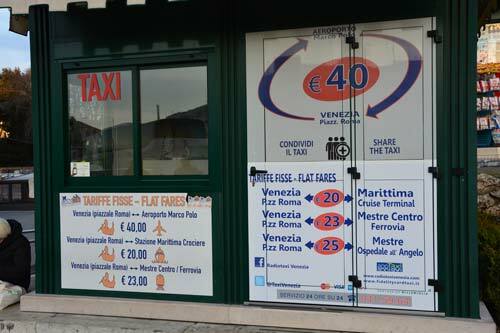 To give you a couple of examples: Expect a one way ride ride from the cruise terminal to the city centre to be 40 euro, to San Marco square 60 euro. Prices are per taxi, up to 4 people. Ferries are your best friend! There are two main companies (Actv and Alilaguna) providing ferries service across Venice and the other islands. Get the People Mover to Piazza Roma. This is where you will find the central station next door where you can hop on the Actv ferry system. You can buy a day pass for 20 euro per person. You are also able to buy a single ticket valid for 75 minutes for 7,50 euro. The ferries are officially wheelchair accessible, although depending on the tides there could be a gap between the boat and the dock. Close to the dock you will also find a ferry service of Alilaguna. This quick shuttle will take you to San Marco square. See map above for its exact location. The fare is 10 euro one way or 18 euro round trip. Buy your ticket at the kiosk in front of the cruise terminal 103. Venice has a nickname: city of a thousand steps. As we mentioned there are 409 bridges in Venice. Almost all bridges have between 10 to 30 steps to climb. If you decide to walk from the cruise terminal into town, explore Venice by foot and walk back: good choice! Although you might want to wear the best possible footwear you have to prevent sour feet. Keep in mind if you will do everything by foot it will quickly add up to a 10 km walk! The great thing about exploring the alleys by foot is there there are plenty of signage to the bigger sights (like San Marco, Rialto bridge etc). Perhaps the most popular thing to do in Venice: ride a Gondola. You typically don’t find gondola’s at the cruise terminal, but you will find them all over the historical centre of Venice. There is not a set place where you start. 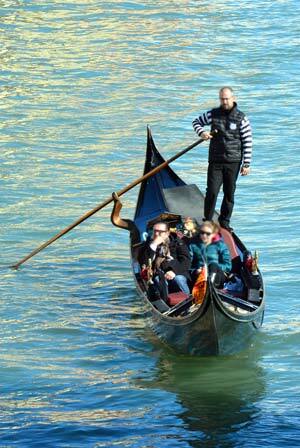 You can simply start your gondola ride at every corner or bridge in Venice. A standard 45 minute ride cost around 100 euro per gondola. Cruise ships sail through the Giudecca Canal before arriving at the cruise dock. Make sure to be on the outside deck about on hour before you dock and the first hour after departure. This will give you a magnificent view over the city centre of Venice as you sail right through its core. Keep in mind though that this route will change in the near future, because ships can cause a small flood on San Marco square. Therefore the prediction is that cruise ships might have to take a different route to the cruise dock in the near future.